I got the IKEA postcard, above, in the mail earlier this week. The yellow square is a hole, and the copy invites you to look through it to imagine how your "space can be beautiful" too. I did, and it was wonderful. It's a pretty standard treatment, which probably got noticed by a lot of Winnipeggers, who are anxious for the new IKEA store to open here. In other Canadian cities, it wasn't so much that the mailer got noticed, it was the the guerrilla marketing campaign that went along with it. And that's when the trouble began. 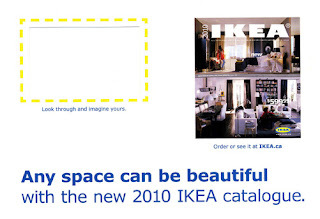 The teams used a chalk-based spray to write IKEA's slogan, website, and release date of its new catalogue on walls and sidewalks, which featured the same yellow box featured in the mailer. The idea: even ugly walls and sidewalks "can be beautiful" with IKEA. "A number of businesses and politicians saw no beauty but an assault on public space, and private as well. A newly opened Vancouver skateboarding shop complained that the chalk artists had defaced its freshly done paint job. "Vancouver claimed the retailer had violated a city ordinance by failing to receive permission for the campaign. A Toronto city councilman wrote Ikea Canada president Kerri Molinaro demanding that the campaign be stopped." IKEA Canada's VP Kerri Molinaro has written a letter of apology, and IKEA has removed all of the offending chalk marks. When good PR saves questionable advertising, all is right with the world. Wherefore art thou, clean place to pee? An entire meal for $10 at Walgreens?! Sign me up! Have you ever been spilled upon in a restaurant? Are there "teachable moments" in Generation Me?